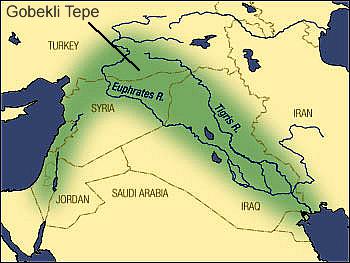 The Fertile Crescent – the ‘Cradle of Civilization’: The so-called Fertile Crescent (shown in green, Fig.1) extends northeast from the Sinai Peninsula, bordered by the Mediterranean coast and the Jordan River, then curves to the southeast, following along the Tigris and Euphrates valleys. It is characterized by unusually fertile soil, and so it is not surprising that humans first created agricultural settlements here over 8,000 years ago, link. For example, archaeological investigations in the Zagros Mountains of Iran reveal that people were grinding wheat and barley about 11,000 years ago, link. And the archaeological site of Gobekli Tepe (locally called ‘Potbelly Hill’) in southern Turkey (indicated in Fig.1) has been carbon dated at around 10,000 BC – older than any other known site, link, link. Bear in mind that the Fertile Crescent probably had a more agriculturally productive climate than today because of massive climatic and geological changes during Noah’s flood around 2300 BC. Babylonia: After the Flood mankind still lived in the Fertile Crescent. In Genesis 11 and 12 we read that around 1900 BC God called Abram (Abraham) to leave the family home in the Babylonian city of Ur (Fig. 2) and go to the land of Canaan. Abram’s journey took him along the Fertile Crescent via Nineveh and Haran (and probably very close to the archaeological site of Gobekli Tepe). Note that the city of Ur was close to the Persian Gulf. Oil and Gas in the Fertile Crescent: At this point it is interesting to ask ourselves; ‘Why are there giant oil and gas reserves in the northern Persian Gulf region?’ – see map. For example, Kuwait is less than one-tenth the size of Syria, but its oil reserves far exceed Syria’s reserves, link. The traditional understanding is that these reserves began as microscopic plants and animals living in oceans. During their life they absorbed energy from the sun which was stored as carbon molecules in their bodies. When they died, they sank to the bottom and over millions of years layer upon layer generated pressure and heat and eventually oil (or gas). Geological and sea-level changes then resulted in the land reserves seen today. So do the large oil and gas reserves around the northern end of the Persian Gulf suggest vigorous vegetation and animal life in that region before the Flood? Are the oil and gas reserves the result of the sudden destruction of the garden of Eden? Eden found? Given these facts, it’s not surprising that the Fertile Crescent has been labelled “the cradle of civilization”. Was this region the biblical Eden? Scholars identify Eden with the Sumerian term ‘edin’, which means “uncultivated steppe or plain” and usually associated with the area today called Mesopotamia (see Fig.2), link. Given that some of the world’s earliest complex societies developed in the Fertile Crescent it is tempting to think Eden is associated with the Canaan-Southern Turkey-Babylonia-Persian Gulf region. Descriptions of the four rivers in Genesis 2 may help us to be more specific. But in attempting this we must bear in mind that ancient world catastrophes like the Flood had the potential to dramatically change the original land forms and river systems, Setterfield. Not surprisingly, two of these rivers, the Pishon and the Gihon, are no longer visible, probably due to geological changes incurred during Noah’s flood. We note that “a river (the Pishon) went out of Eden to water the garden (of Eden)” and flowed past or skirted the land of Havilah. Where was Havilah? Some argue that the land of Havilah has long since disappeared due to massive geological changes, so searching for it is futile, Setterfield. That said, we note that, post Flood, the descendants of Ishmael “dwelt from Havilah as far as Shur” (Gen 25.18), so the land of Havilah was still recognized post-Flood. It was probably one of those regions in the North Eastern area of the Arabian Peninsula, link, as indicated in Fig.3. As stated, the Pishon is not visible today, although it must have been a large river in order to “water the garden”. In fact, satellite images and space Shuttle Imaging Radar suggest the river was once up to three miles wide, link. Analysis of these space images shows that, in Kuwait, a dry riverbed (Wadi Al-Batin) cuts through limestone and disappears into the desert of Saudi Arabia. The river ran underground along a fault line under the sand. From the Hyaz (Hejaz) Mountains in Saudi Arabia, link, this river ran northeast to its delta in Kuwait near the Persian Gulf. It is interesting to note that Pishon literally means “to disperse”, or “to spread”, suggesting the parting into some form of delta or ‘riverheads’ as in Gen 2.10. Given these recent discoveries, some claim this lost river corresponds to the biblical Pishon River associated with the garden of Eden. The fact that the Pishon “went out of Eden”, “skirted the whole land of Havilah” and “parted into four riverheads” suggests that Eden was a large area of land to the north of Havilah. The word Gihon means “stream’. This ‘stream’ is said to have flowed “around the whole land of Cush” (Gen 2.13). In early biblical history, Cush (pronounced Kush) was the name of a district near the head of the Persian Gulf, link. More specifically, it could be the country still known as Khuzi-stan, on the east side of the Lower Tigris, link. This agrees with the claim that Cush was is in Mesopotamia (rather than in Ethiopia), link. The Amplified Bible also places Cush in Mesopotamia. It is interesting to note that, today, two major rivers flow from the Iranian mountains in the east down to the southern part of the Mesopotamian flood-plain, viz. the Kerkha and the Karun, link. So the Gihon River could have flowed in Iran and the Zagros Mountains, link, as indicated in Fig.3. In Genesis 2 these two rivers are associated with the “four riverheads” (river delta?) coming from the Pishon. The Tigris or Hiddekel flowed “towards the east of Assyria (Heb: Asshur)”. Hiddekel means “flowing rapidly”, indicating it either went through land with a high gradient or had a large quantity of water flowing in it, or both. Maps show the ancient Tigris River flowing through a fertile alluvial plain, link (consistent with the concept of ‘Eden’). The Hebrew word translated ‘Euphrates’ is Perath, which literally means “to break forth”. Are these two rivers of Genesis the two rivers we see today? Today, the mountains of Turkey collect water that becomes the observed Tigris and Euphrates rivers. But today’s Tigris and Euphrates may not be the original rivers! As already mentioned, we must bear in mind that the massive geological changes of the ancient world (as occurred for example in the Flood) could have changed the rivers of Genesis 2, Setterfield. Today’s Tigris and Euphrates could be running on top of flood-deposited layers of rock. That said, many still assume that the approximate location of the ancient Tigris and Euphrates rivers was as seen today, again as indicated Fig.3. It has been suggested that, viewed from the Persian Gulf region, all four rivers could be seen as “riverheads”. Little is known about the climate of Eden and its garden and there is much speculation! 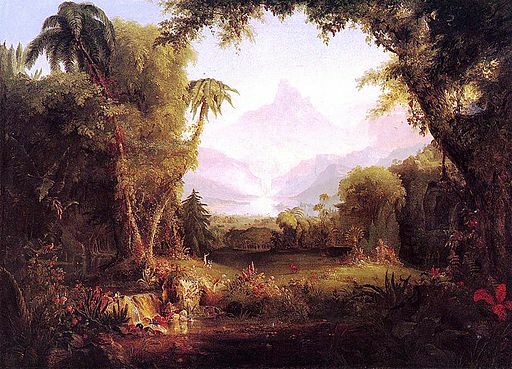 Artistic impressions paint an idyllic sub-tropical environment for Adam. But what do we know with reasonable certainty? At the outset, Adam’s environment must have been conducive to plant growth – many different trees grew and fruited (and it seems that before the Fall there were no weeds!) Also, there is no record of Adam being too cold or too hot or buffeted by storms. Some argue that there was no rain before the Flood and instead “a mist went up from the earth to water the ground” (Gen 2.5,6). Either way, it seems things were environmentally quiet and peaceful. Everything God had created was “very good” (Gen 1.31). How can a severe storm be ‘good’? In addition, we note Adam and his immediate descendants lived approximately ten times longer than present generations. Why? Adam’s world: A universally warm and pleasant Earth? Some maintain that before the Flood the earth’s axial tilt was perhaps only 5 degrees (or less), resulting in virtually no seasonal changes and one large stable Hadley Cell of circulating air currents, link, link. The deductions are based on measurements from ancient ‘gnomons’. It is conjectured that the earth was probably universally warm, with no deserts, ice caps or major mountains. There was probably less sea and more land. Lush vegetation grew worldwide, so providing for the coal and oil deposits we now find near the poles. It has also been conjectured that rapid radioactive decay heated the earth’s mantle below the crust, driving out the water locked in the minerals. This water seeped through the earth’s thin granite crust and appeared as a mist, watering the ground (Gen 2.6). As stated, with this early-earth low-tilt model there would be virtually no seasons, and we note that the first mention of seasons and the associated ‘cold’ and ‘heat’ is after Noah’s Flood (Gen 8.22). And it is argued that a sudden change leading to the present 23.4 degree tilt arose around 2300 BC, possibly due to asteroid/meteor impact. Another sudden change in axial tilt at the end of this age is suggested in Isaiah 24.19-20. More at young earth model. Genesis 1.6 mentions a “firmament” (Heb: raqiya, ‘an extended surface’) that divided the created waters. What was this? And did it provide an idyllic environment for Adam and his immediate descendants? Moreover, did it protect them from damaging solar radiation? So in this theory the Hebrew word ‘raqiya’ refers to both the universal expanse and the localized crystalline structure suspended above the Earth as one seamless whole. Man’s Aging: It is claimed that the crystalline canopy suspended perhaps ten miles above Earth’s surface had the benefit that it filtered out most of the damaging UV radiation i.e. DNA damage at the molecular level. It is conjectured that, at the judgement of the Flood, the localized microcosm – the ‘canopy’ suspended over Earth – was disrupted as ‘windows were opened’ in the crystalline lattice. This could have been done by jets of steam from hydrothermal vents in the earth’s crust. Consequently, man was subjected to increased radiation. It is scientifically plausible that a significant increase in radioisotopes in the atmosphere after the Flood could cause the observed progressive reduction in the age of man after the Flood, see human aging. 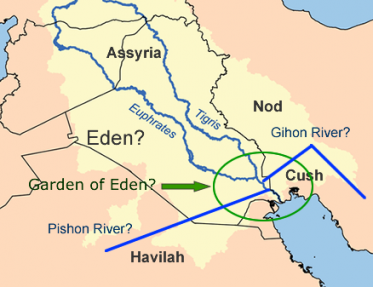 Eden: From the foregoing discussion, Eden (the land) could have been the large region bordered in the south by the land of Havilah (possibly NE Arabia) and embracing the Tigris River and Mesopotamia in the east. A northern boundary might be indicated by references to “the people of Eden who were in Telassar” (2 Kings 19.12 Isa 37.12). This city was inhabited by the Bene ‘Eden and was possibly located in the upper Mesopotamian country, link, link. In fact, since the so-called Fertile Crescent is often called ‘the cradle of civilization’, it is tempting to see it as the eastern, northern and western boundaries of Eden. This would include the biblical land of Canaan as part of Eden. The land of Nod (the land of Cain’s ‘wandering’) is said to have been ‘on the east of Eden’ (Gen 4.16) and so outside Eden, as indicated in Fig.3. The Garden of Eden: Many commentators place the garden of Eden in the Persian Gulf region i.e. ‘eastward of Eden’, as indicated in Fig.3. 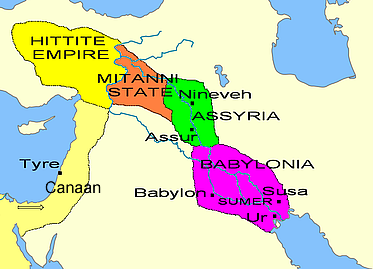 Some believe the earliest inhabitants in Mesopotamia (see Fig.2) originally lived in this region. The massive oil reserves in this region may even be the result of the sudden destruction of the garden by the Flood c2300 BC. Also bear in mind that at that time the sea level was much lower and sea levels have gradually risen. By c5500 BC most of the Gulf basin was filled, although the sea level was still 17 meters lower than that of today, link. The Persian Gulf did not reach its present levels until Abraham’s time c4000 BC, link. The environment of Eden (and probably that of the whole earth) could have been enhanced and protected by a ‘canopy’ above the earth. Sadly, Adam’s time in the garden was short-lived since he and his wife were driven out after the Fall (Gen 3.23,24). From this time on, Adam’s life became difficult as the ground came under God’s curse (Gen 3.17-19), and it is logical to assume that the garden was completely destroyed by the Flood. But whilst it existed, there were 11 overlapping generations with a span of a thousand years that would have had direct knowledge (person to person) about Eden and the Garden, including Noah and his family, link, link. Bear in mind that, pre-Flood, man lived much longer and Adam lived 930 years (Gen 5.5). For more on man’s changing life-span see Human Aging. When man was driven out of the garden of Eden after the Fall (Gen 3.23,24), and the Flood came to destroy evil mankind, was this the end of Eden and its garden for all time? Was God’s beautiful creation to be lost forever just because man sinned? Studies of Israel’s history and prophesied future suggest not. There appears to be a close relationship between the land of Israel (past and future) and Eden and its garden. It is widely claimed that the earliest civilizations lived along the Fertile Crescent, giving the region the name ‘the Cradle of Civilization’. As discussed, some scholars associate this region with the biblical Eden, and some associate the Persian Gulf area with the garden of Eden. So since the Crescent spans from the Persian Gulf across into southern Israel, we might tentatively associate the land of Israel with Eden (and even the garden of Eden)! Is there any justification for this claim? Jewish tradition does indeed place Jerusalem at the center or midst of the earth, and some see the temple mount in Jerusalem as the true ‘ground Zero’ of the world, link, link. Is this concept figurative, or can we take it literally? If Jerusalem really is the geographic center of the world then maybe Jerusalem is closely associated with the Eden of Genesis? Crombette assumed that, initially (i.e. in the days of Eden), the waters were equally divided and that at the Flood the waters above the firmament ‘collapsed’ to fill the oceans below the firmament. This concept is similar to the ‘water-canopy theory’. So Crombette assumed that in the time of Eden the mean ocean depths were only half as deep (c2,000 m) as the current depths (c4,000 m). Today’s continental shelves would then be above the water line. The interesting fact is that at 2,000 meters bathymetric maps show that the current continents fit almost perfectly when they are moved into place. So, by adhering to the biblical text, Crombette showed that when the present continents are repositioned, they fit almost perfectly at a depth of 2,000 meters. Moreover, it is claimed that the center of the single continent is Jerusalem, link, link. Staying with biblical concepts, Noah’s Flood has been conjectured as the mechanism and timing for the division of this single continent, link. Modern Calculations: Today, the geographical center of all current land-areas can be computed using satellite data and great-circle distances on the sphere of the earth, link. Using this approach, Holger Isenberg computed the geographic center at 37.7°N 35.4°E, corresponding to a location in southern Turkey, link. The discrepancy between this location and Crombette’s location (Jerusalem) must be partly due to the fact that Isenberg’s calculation is based upon current sea levels. So they do not apply to Adam’s pre-Flood world, although they do provide some confirmation of Corbette’s calculations in that the ‘midst’ of the earth is around the Eastern Mediterranean. Conclusion: It is reasonable to conjecture that God would have placed Adam near the center of this single continent rather than at its periphery. In other words, Adam could have been placed near to the location of the future Jerusalem. The implication then is that Jerusalem could be closely associated with Eden, even the garden of Eden itself! Canaan – where was it? : God promised Abram (Abraham) and all his descendants “all the land of Canaan, as an everlasting possession” (Gen 17.8). Why Canaan? What was special about Canaan? Moreover – where was Canaan? On the day of God’s covenant with Abram, God defined Canaan as running from the river of Egypt (traditionally identified as the Nile, link) to the River Euphrates (Gen 15.18). The same boundaries are found in Exod 23.31. The tribes of Israel occupied most of this area, link, and there are indications that the kingdoms of David and Solomon c1000 BC did indeed stretch from the river of Egypt on the Sinai peninsula, across the Syrian Desert to Tiphsah on the northern parts of the Euphrates. 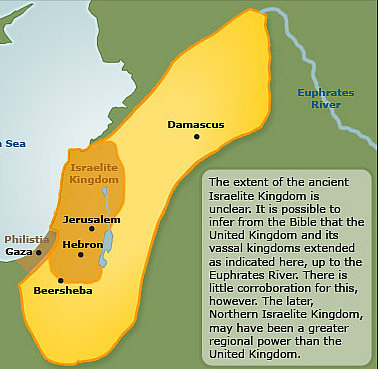 So the biblical Canaan closely followed the Fertile Crescent northwards and eastwards. Prior to these kingdoms, God gave Moses the boundaries of Canaan as the children of Israel entered the land (Num 34.1-12). The southern border went through the Wilderness of Zin to the river of Egypt, the western border was the Mediterranean Sea and the eastern border ran north from the dead sea along the Jordan up to Zedad (modern-day Sadad in Syria) in the north east. Virtually identical boundaries to those given to Moses are given in the future boundaries of Israel (Ezek 47.13-21). So even as late as c600 BC it appears that, at least parts of the land of Israel reflected the blessings of Eden! That said, man gradually had a detrimental effect on the environment in Canaan e.g. deforestation and the loss of many species of mammal and birds due to hunting, link. This concept is mind-blowing! But is it any more than when Christ the Son of God walked this earth 2,000 years ago? As to be expected, when it comes to fruit trees the future land will be blessed with fig trees and vineyards (Joel 2.22). Why does God do this? All this is done to make Christ’s future dwelling place on earth, His sanctuary, ‘glorious’ (Isa 60.13). Even now the land of Israel has seen significant aforestation. Since 1900 some 250 million sub-tropical trees have been planted in all regions of Israel, from the Golan and Galilee in the north to the Negev in the south, link. 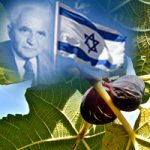 With the passing of time, when the people of Israel forgot their God, the “early” (Autumn) and “latter” (Spring) rains were delayed or did not fall. But when the Jewish people acknowledge their true Messiah (Christ) it seems that God will bless the nation with the required rains (Jer 31.11-12). Here, the term ‘holy mountain’ is usually taken to mean ‘the mountain of the LORD’S house’ (Isa 2.2, Ezek 40.2) – a reference to the preeminence of Zion (Jerusalem) above the other ‘mountains’ or nations, and in particular the area surrounding the new temple (see a new temple in Jerusalem). In fact, the whole world will be at peace during the Millennial age and “nation will not lift up sword against nation” (Isa 2.4). It seems that in this ‘new Eden’ around Zion, meat could again be ‘off the menu’. Where prophecy speaks of future flocks of sheep and cattle (Isa 30.23, 61.5) this may be in other parts of Israel, or for temple sacrifices (Ezek 43.18,19 Zech 14.21). A Healthy Environment: Ezekiel 47.12 refers to the healing benefits of Israel’s trees. Is this a reference to the future widespread use of herbal medicine? Note that the future inhabitants of Zion will not say “I am sick” (Isa 33.24) and people will live long lives (Isa 65.20). Will this future Eden-like environment reflect the healthy environment of Adam’s world? Note that this protective ‘canopy’ echoes the atmospheric protection Adam appears to have benefited from, albeit on a much smaller scale. There is a deep spiritual connection between the garden of Eden and the Hebrew temples. Consider the first ‘temple’. As the Israelites were travelling through the wilderness towards Canaan, God asked them to make a place where He could “dwell amongst men” – a sanctuary or tabernacle (Exod 25.8). Clearly, this had to be portable and so it became known as ‘the tent of meeting’ (Exod 29.11, 33.7 NASB). After the Israelites were established in Canaan, the sanctuary became a permanent structure, as in Solomon’s Temple (2 Chron 3), only later to be destroyed and replaced by Herod’s temple. 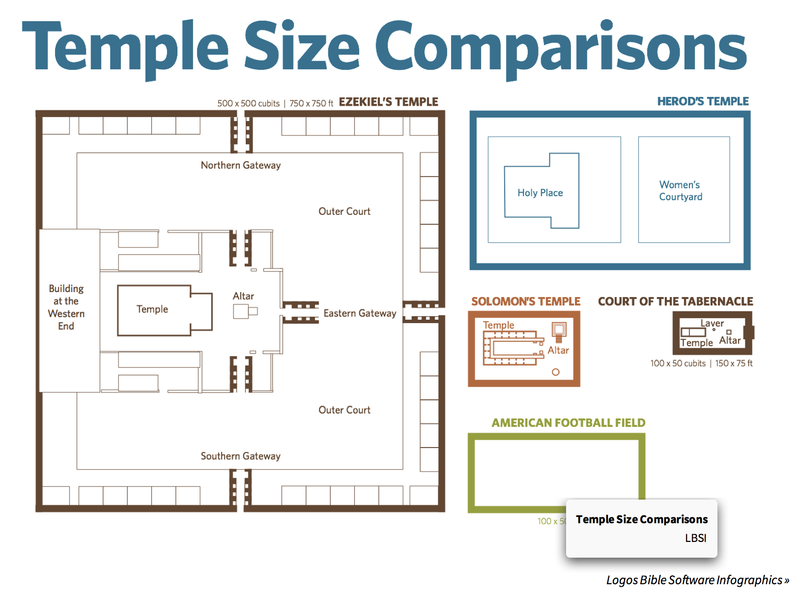 The basic structure of Solomon’s Temple is shown in Fig.5, link. Fast-forward to the Millennial age, and we find details of a new temple in the Jerusalem area in chapters 40-48 of the prophet Ezekiel. Conclusion: The garden of Eden and the earthly temples reflect the heavenly temple (Rev 11.19, 15.5-8). They speak of human access to the presence and glory and power and blessing of the Creator God – the God of Israel. Recall that when Moses and Aaron came out of the tent of meeting to bless the people, the “glory of the LORD appeared to all the people” (Lev 9.23). Put another way, although the original Eden and its garden appears to be lost, the concept lives on in the spiritual symbolism of the Hebrew temples. Like the garden of Eden, the temples demonstrate that redeemed man can walk eternally with his Creator in abundant blessing. This sees the future people of Israel living with their God in a pleasant place – their ancestral ‘garden home’ – a latter-day Eden centered around Jerusalem!